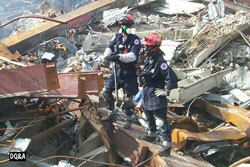 Since 1991, the South Florida Urban Search and Rescue Team (FL-TF2) has been serving the national community in times of need. The team is designed to respond to a variety of disasters, including earthquakes, hurricanes, typhoons, storms and tornadoes, floods, dam failures, technological accidents, terrorist activities and hazardous materials releases where victims may be trapped, lost or injured. With only 3 1/2 hours notice, this nationally recognized group can be on its way with 80 highly trained members and thousands of dollars worth of specialized tools and equipment to a community in need. The City of Miami is the sponsoring agency of the Team, providing administrative staffing, warehouse space and other infrastructure needs; however, the team is also composed of experts from 23 additional fire and police departments as well as professionals from the civilian ranks. The South Florida Search and Rescue Team welcomes you and hopes that you will take a few minutes to become acquainted with our site.